We never go out on Valentine’s Day, I prefer to stay home make our own special home cooked dinner. I added filet mignon on the menu for Valentine’s, but if it’s out of your budget you can swap it for a less expensive steak. Hope everyone is enjoying these meal plans! If you’re new to my meal plans, I’ve been sharing free, 7-day flexible meal plans (you can see my previous meal plans here) that are meant as a guide, with plenty of wiggle room for you to add more food, coffee, beverages, fruits, snacks, dessert, wine, etc. You should aim for around 1500 calories* a day. NOTES: 1 Green salad includes 5 cups romaine, ½ cup each: carrots, tomatoes, cucumber, chickpeas, 2 scallions and ½ ounce shaved parmesan. Please keep posting! I love these meal plans! 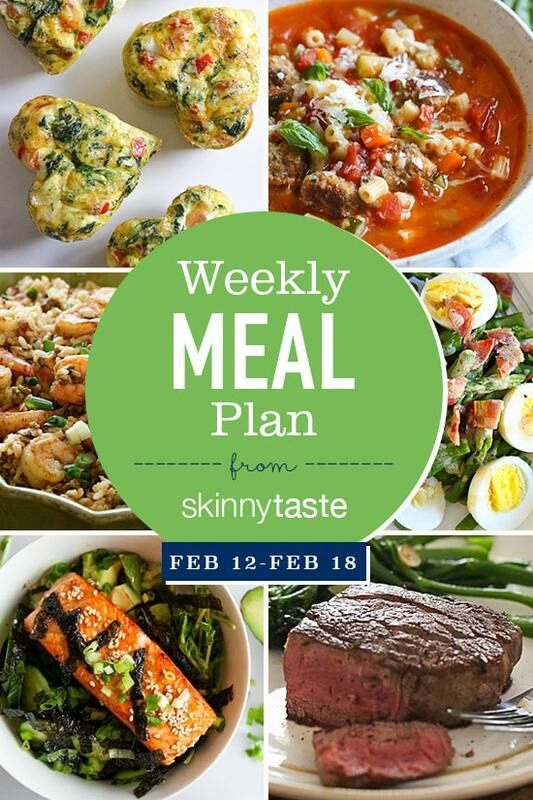 These meal plans are amazing and the shopping list for each week is an added bonus! I just found your site recently, I wish I knew about it sooner!!! So helpful in planning out a week of healthy and delicious meals. The nutritional information is very helpful too because I am watching my calories in vs. out and most recipes don’t have that vital information on it!!! I’ve recommended this site to friends and family because it has such a variety. Keep up the wonderful work!!! Started your meal plan for Feb 10th week, just discovered it this past weekend. LOVE all of them so far, I hope you keep doing the meal plans-my husband’s blood sugar is down too, he’s diabetic. We plan to buy one of your books this week! I use the meal plans!! I love that you make these so easy with the grocery list! Keeps me on target ???? I am so glad I found this! I’ve tried meal planning before but I always end up either making the same dishes over and over and getting bored, or not being able to figure out the portions/calories properly and just giving up. This exactly what I need to jumpstart a healthier lifestyle, I feel so motivated, I just added the items to my grocery list! Everything looks so delicious and easy! Please continue sharing! this is amazing! I’ve been using your website for years. Thank you so much for all the work you out into your recipes! I always meal plan, but now I will be using your meal plans, so, yes, please continue creating these! Trying out your meal planning to get my eating and weight back on course. Love them. The shopping list and weekly plan table are brilliant. I just learned of this site and it looks great, I love that I can make some choices of my own. I have much of the items on this list so I plan to start this today or tomorrow and catch up to current be posting. When do you post the meal plans? Love the meal plans haven’t tried one yet but looking forward to it as I love all recipes on this site, and this looks like good way for me to start eating healthy! Wow, this is a lot like what I do on my own, especially the leftovers the next day for lunch. So similar to what I already do, I can’t wait to incorporate this for new ideas and it looks like you are managing the points better than I do !! Thanks a million! I love these! Is there a way to print out the meal plan in it’s calendar form? I find this to be so helpful! Thank you for these meal plans! Keep the meal plans! Soooo helpful and keep me and my family on track!!! Is there a reason why the saturated fat count is missing or is wacky in the nutritional breakdown? Some people need to know that information to met their dietary guidelines. I love the fact the you include the sodium count with your recipes. Helps those of us with heart disease. I’m just starting WW Freestyle and I’m going to use this meal plan…thank you for sharing! Thank you so much for these meal plans. The drudgery of meal planning definitely gets in my way when I try to stay healthy and eat at home. This is a huge help! Thank you for continuing to share your meal plans! They are a definite life saver for me. Thank you so much for all the work you put in to these meal plans! I recently purchased the Fast and Slow cookbook and followed the first week meal plan exactly. It was probably the best week of meals in my life. I tried several new things and really enjoyed them. Every thing was a hit with my family! I definitely plan to continue following your plan, and the grocery list makes it that much better! Please keep doing this! You received a nice shout out at my WW meeting a few weeks ago. That’s how I found out about you:) My husband would be quite upset if you stopped! Thanks so much for making these meal plans and shopping lists, it has helped so much, I always look here first for inspiration when starting my meal plan for the week. We also have both of your cookbooks and use them regularly as well. Thanks for making delicious healthy recipes! Thank you very much for taking the time to share your weekly meal plans. I use them. They are detailed and delicious! You have helped keep my family eating healthy for many years! Thank you! Just wanted to let you know that I have been loving your full meal plans and have been using them every week! I really appreciate you taking out the guess work and helping me reach my weight loss goals. Thank you! Please please pleas continue to share meal plans. They are a lifesaver! LOVE the menu & grocery list. Thank you!!! Your Meal Plans are terrific! Please continue sharing. I use them! I love your menu plans. Keep them coming. I shop and cook based on them. I appreciate them sooooo much! I’m going to be using the grocery list starting this week. My br is excited that he won’t have to think about it. I’ve been following you for years! You got me hooked on your zucchini enchiladas boats and I just love your variety and healthy recipes. I have used your skinnytaste recipes and love them, but just recently subscribed to the mailing list. I was surprised and pleased to receive a whole week’s meal plan. Woo-hoo! and thank you! Please keep them coming!!! I love the ideas and inspiration!!! I’ve come to rely on it! Gina, I have your cookbooks and love your approach to healthy eating. I have recently started Weight Watchers and find your weekly meal plans with grocery lists invaluable. Thanks for all you do! I look at the recipe every week.So many excellent recipes.Keep up, I am a fan. Also like this format. Which allows you to see the whole week at once. I never realized planning ahead for meals was so much work and so time consuming until I started doing it on my own. You’ve taken the work out of it. Thank you. Please keep your meal plans coming. Thank you for posting these! They are so helpful and I wait with anticipation for Saturday to see what tasty meals the following week will bring. My favorite go-to meal planning site for healthy living 🙂 So respected and appreciative of your guidance and suggestions each and every week. These weekly meal plans are helping me so much! For me, the hardest thing is deciding what to make, and then doing the grocery list. You are helping me and my husband, enjoy new and healthy meals. Please, please keep ’em coming. I love all your recipes, keep up the wonderful work! I wish I had you to cook for me lol !! I started Weight Watchers 5 week’s ago because I needed more energy. My sister in law turned me on to your website and recipes. I have loved everything I’ve cooked! I especially enjoy the Latin flare to some dishes. I have an air fryer and instant pot in my Amazon shopping cart. I’m down 14 pounds and am still going towards my goal. I feel better and enjoy what I’m eating. I’m always satisfied. Thanks for your help and support. I raise three kids and work full-time and your weekly menus and daily recipes help a lot. Thanks for all you do! You’re welcome Rebecca! Congrats! Great job! This was so in-depth, so many diet plans to follow, WW, paleo, Whole30, ect. You even added a grocery list too ..Thank you!! Love these plans!! Breakfast and lunch are meals where I tend to “overspend” on points from not planning well – that’s why I really appreciate having a guide to follow for the week! I’m new to this meal plan. Some recipes call for the Instant Pot which I do not have and do not want to splurge on as I just bought the Air Fryer. Can and how do I adapt the Instant Pot recipes to my slow cooker?? Thank you. Yes you can adapt almost all to the slow cooker, depends on recipe on the changes. I use your meal plans a lot. And what I like about the new way you are doing them (breakfast, lunch included, plus daily point totals and calorie counts) is that I can finally see on paper how the new freestyle plan can be satisfying and still leave enough points for snacks. I was having trouble with that because I was so ingrained into the old Smart Points. Your meal plans are extremely helpful, and I hope you’ll continue to post them. Thanks mainly to your site, I’m able to stay at goal for over a year while not getting bored with my food. Many thanks, Gina. Please keep posting the meal plan and grocery list. I have been looking for something like this for a long time. I have just joined Weight Watchers as well. Thanks you have made this easier for me. I have used your meal plans for a while now and, I greatly appreciate them. Please keep posting. I know it has to be a lot of work because planning meals and making grocery lists takes me a lot of time. I am a working mom and, I appreciate what you are doing because it takes something off of me. You are providing a service that is valuable. Thank you! I love your recipes! I’m cooking for one so I don’t make all the dinners, it I actually look forward to the leftovers! LOVE these plans- makes it so easy for me to head to the store and cook but still enjoy time with my family. Thank you!! Hi Gina! I have been using your plans every week since December and have been a subscriber for years. I love them! Cooking has never been the difficult part for me. The difficult part is opening my fridge and not knowing what to make that will be satisfying. These meal plans make my week so much less stressful! Thank you so much! I’m new to meal planning and find your plans extremely helpful. Please keep posting them, they are appreciated. I look at your plans and they help me plan our meals. I look at it every week. I may not use all the meals but usually at least three or four and up on my weekly meal plan. I think it’s great and I get some ideas or remember recipes I forgot. I have a question about the points for the omelet muffins, you say you have having 2 which is 4 smart points but then the recipe says that a serving size is 2 and that is 2 smart points. Yes!! Please keep doing them! I love them for ideas for the week! Love your meal plans!!! I have been using them a lot please keep posting them. Yes please continue! I lost 50 lbs over the last year and this was partially due to your cookbooks and blog. Can you tell me how to print the menu? I still like to have a hard copy in my menu planner:). Can you take a screen shot and then print it once it’s in your photos? Always helpful to have your recipes and the WW points. Yes, please keep doing this! This will be my third week following your plan and I am thrilled with the delicious meals and the scale victories! The shopping list has been a major help for me. Thank you!!!! Was just introduced to this website by a coworker who brings in meals that his wife makes. What a great idea the weekly planner is and helpful to those of us just starting this journey. Thank you so much. I am so excited about this, it should make my week much more managable! Thank you so much for creating! Love the weekly meal plans! Yes please keep posting. We use your weekly planner every week ❣️???????? Thank you we also have ur cookbooks and use those religiously. We are on the right track to a healthy lifestyle ???????? Where you have loaded baked omelet muffins (2) at 4 points, is that 2 muffins or 2 servings (4 muffins) because the recipe says that 2 muffins (1 serving) is 2 freestyle points. Just wanting to make sure! Gina, can you do me a favor and please never stop posting your weekly meal plans? I used to hate grocery shopping and cooking but your meal plans have now changed my outlook on the whole process. I have exercised and yo-yo dieted for years and it’s finally clicking that no matter how much I exercise, I cannot outwork my diet. I thank you and my scale thanks you! For the meal plans would it be possible to put an estimated price? It would really help when budgeting for the meals but love the recipes keep them coming! I am going to start using your weekly meal plans. I will start on Monday! Can’t wait! They look delicious! Thank you for this!! I love that you took the time to make the list. I am definitely going to use these! I use these meal plans every single week! They help me stay on track and I have lost weight every week since finding them! Please keep posting them! LOVE THEM! The shopping list is really, really appreciated. I’m usually cooking just for 1 so I make half the recipe and then freeze the other half so I’m doing way less cooking that I used to and it’s better for me. I’ve served your recipes to friends and family without telling them they’re ‘skinny’ and they’ve all loved them.Thank you for offering these meal plans, it really makes it much easier to stick with eating healthy. Oh my gosh! This meal plan is perfect, and will definitely make it so much easier to cook healthy meals for my family all week. Thank you so much! Usually I’m so excited for the weekly meal plan, but butternut squash roll ups FOUR times in a row? I’ll be skipping this week. I will definitely use this during this week, especially the breakfast and lunch options! Thank you for putting this together! I love these meal plans! They are perfect for my family and myself! Thank you! Gina, these meal plans are amazing! I have spent so much time looking for WW meal plans online and yours truly are the best. Please keep posting them. I mention your website at my WW meeting regularly. Thank you for your recipes. I’m a bit confused . The baked omelet recipe lists 2 omelets is a serving for 2 freestyle points . In you meal plan it lists 2 omelets as 4 points. Am I reading something incorrectly? Is there a reason why my comment hasn’t been posted? I’m wondering if 2 Baked Omelet Muffins means 2 muffins or 2 servings. Thanks! I love your recipes and the meal plans are great. 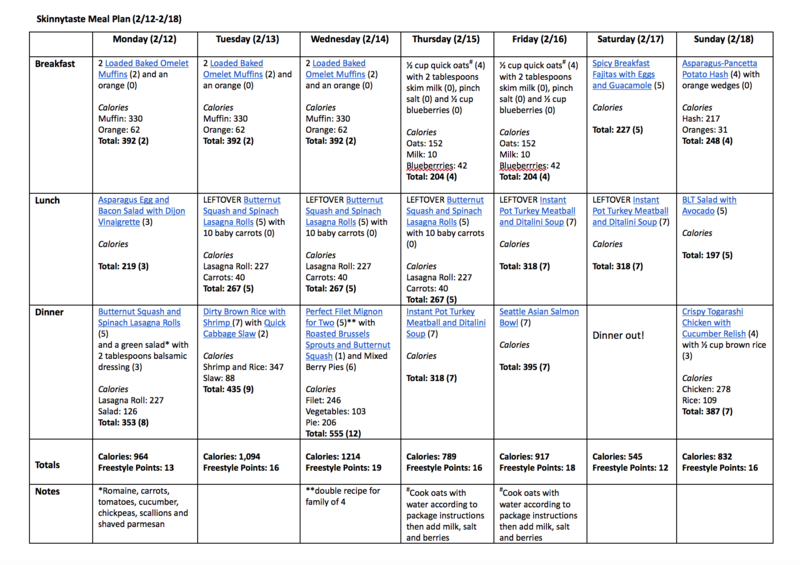 Just started using your meal plans as a guideline for our week!!! Loving them!! !